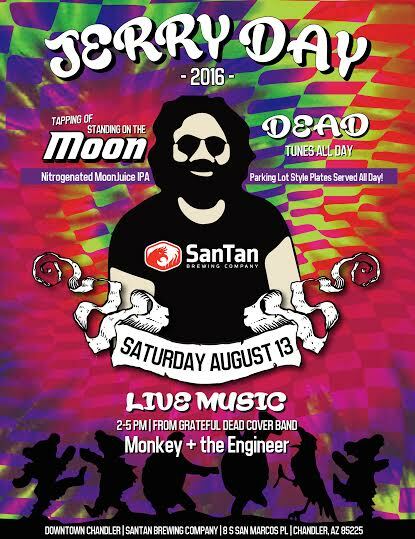 Deadheads get out your tie dyed shirt and join SanTan Brewing Company for its annual Jerry Day at the Brewpub! Set for August 13, 2016, Jerry Day is a birthday celebration of the legendary music and culture of the Grateful Dead front man, Jerry Garcia. Jerry Day will feature a special tapping of “Standing on the Moon” Nitrogenated MoonJuice IPA. Plus, enjoy Dead tunes all day with live music from Grateful Dead cover band, Monkey & the Engineer from 2-5 p.m. Tie Dyed SanTan t-shirts and parking lot party themed food specials including bean and cheese burritos and grilled cheese sandwiches will be available for purchase. There is no cost to attend, so invite your friends through SanTan’s Facebook event page here: https://www.facebook.com/events/1108684355863145. SanTan Brewing Company is located in Downtown Chandler at 8 S. San Marcos Place.